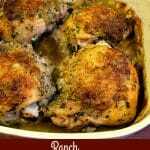 Crispy, tangy baked Ranch Chicken Thighs are a delicious, easy dinner great for kids and adults alike, and are ready in under an hour. Amanda is seven now, and still an incredibly picky eater. I shouldn’t be surprised, she is just like me! Well, almost. She won’t eat mashed potatoes, or sauce on spaghetti, and I don’t think that’s normal. But, I digress. 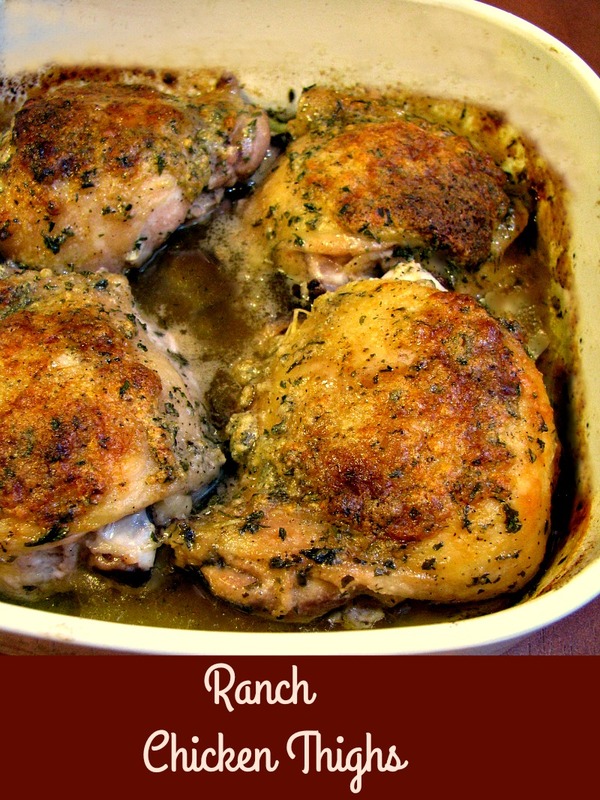 Two things she has always loved is chicken and ranch dressing, but she never had them together in a recipe until I made these oven baked Ranch Chicken Thighs. I love it when I find something new that we all agree is good! My husband will eat pretty much anything, but I can’t count how many times Amanda has barely taken a bite of something new and decided she hated it. Not this time! These chicken thighs with ranch seasoning quickly became her new favorite. Normally when we have chicken, Amanda insists on rice with it. This time I wanted her to try red quinoa, and she ate it. Of course, she kept calling it rice even though I told her what it was, but I got her to eat something that she normally wouldn’t, and is healthy. This dinner was definitely a win! The Ranch Chicken Thighs, which were inspired by Carrie’s Experimental Kitchen use bone-in, skin-on thighs, coated in canola oil, with a dry ranch seasoning rub. Bake them in a casserole dish at 375 F for about 45 minutes. 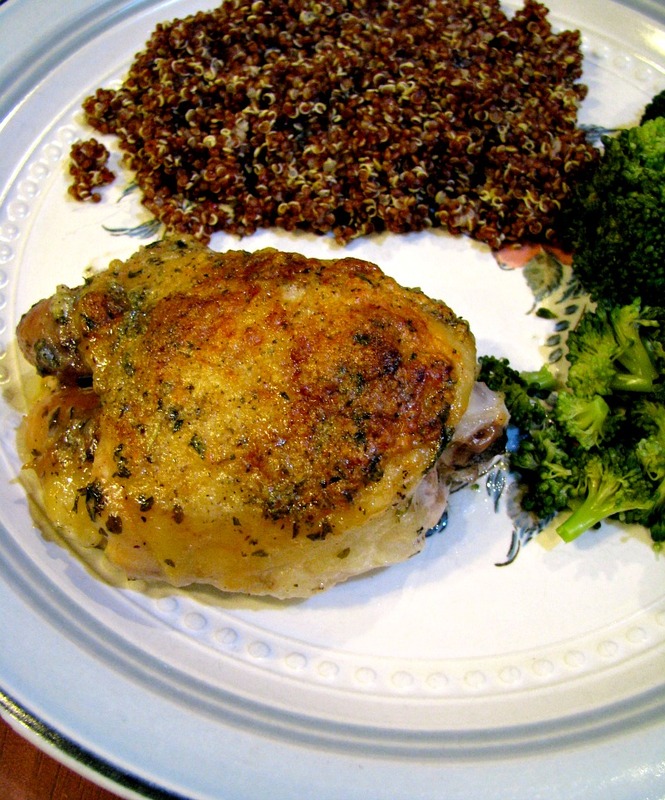 They come out with a crispy browned, tangy skin (you can easily remove it if you don’t want the fat, and the chicken is still amazing) and juicy, flavorful chicken. In a shallow bowl combine the ranch dressing mix, parsley, salt and black pepper, mix well. Place the chicken thighs in a deep casserole dish, pour the oil over the chicken and turn to coat. Rub the chicken with the ranch mixture, turning and coating all sides. Bake in the preheated oven for 45 minutes, or until it reaches 165 on a meat thermometer. Made this tonight and it turned out great. Thanks for sharing. I’m so sorry I missed your comment, and so glad you liked it! I will be making this tonight. Excited to try it. Will post comment afterwards. Jan3/19 – I have this in the oven now and can hardly wait for supper. It smells so good! I have boneless only, will the recipe still work? Hi Sylvia, yes, you just might have to bake them for less time if they are smaller. They are in the oven right now. Smells so good in here! Perfect night to have the oven on; it’s soooo cold out! Thanks for commenting and rating, I hope you liked them!